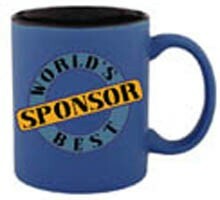 We All Appreciate Our Sponsors, So Why Not Tell 'em With This 'World's Best Sponsor' Mug. It's Ocean Blue with Black inside and very nice. (or get it for yourself).